Click here for proven resources to help you improve your act! 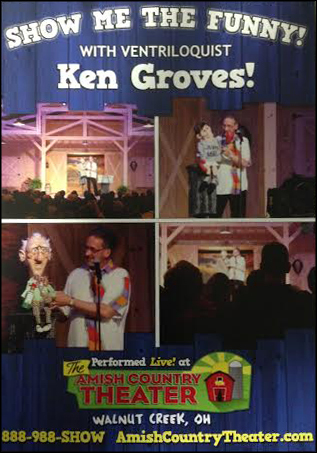 Ken's brand-spanking-new DVD is hot off the press! at the Amish Country Theater. Get your copy today before they sell out! What does Ken do to put the fun in your event and make you look great ? "I've never laughed so hard in my life! You were outstanding. . ."
AND what you'll see is your audience enjoying themselves - laughing constantly - hearing your message - and remembering what a GREAT JOB you did in organizing everything. . .
"Boy did you make me look good! I've never had so many people come up to me and tell me, "Great job!" To find out how Ken can put the fun in your event and make you look GREAT, contact us as EARLY AS POSSIBLE with several possible dates so that you aren't disappointed. Click here to find out who Ken has performed for and who all is in the show!